Fermented foods are the specialty at this unusual Ginza dining bar, with an emphasis on European dishes incorporating either miso, cheese, or both. 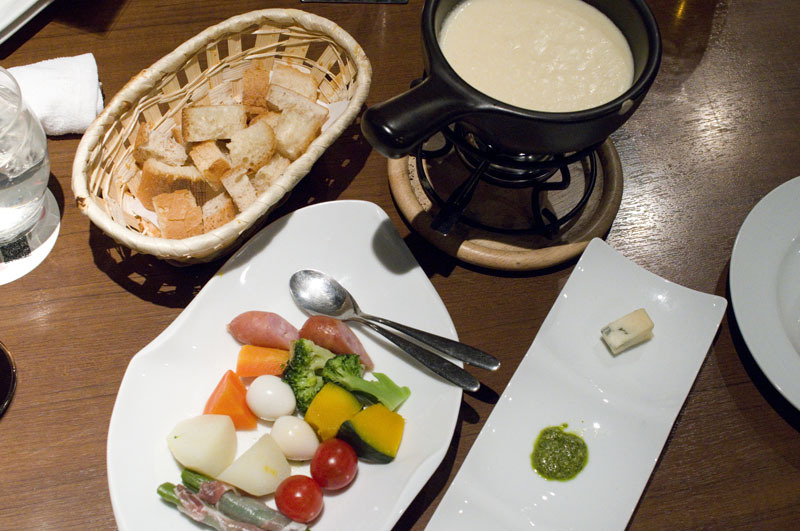 A tasty four-cheese fondue, flavored with Kyoto-style miso, is a specialty of the house, and the selection of miso-marinated and seasoned grilled meats is well worth exploring. Everybody seems to start with the fondue here, so you might as well order it when you sit down. It comes with an appealing assortment of vegetable and meat tidbits for dipping, plus unlimited bread, solving the age-old fondue-restaurant problem of having to ration your bread to match your cheese consumption. You'll also get a small dish with extra seasonings like spicy tomato miso, gorgonzola and pesto, which you can add halfway through the course to liven up the cheese pot. A bagna cauda otoshi, served with a miso dip instead of the usual anchovy sauce, is dainty in size but quite appetizing, setting the mood for flavors to come. The maguro-avocado tartare starter is a good foil for cheesy dishes, and is one of the better versions we've found of this popular dish. Various cheese-focused pizzas and pastas will satisfy your need for carbs, but the the miso-infused grilled meats are really the star of the show. 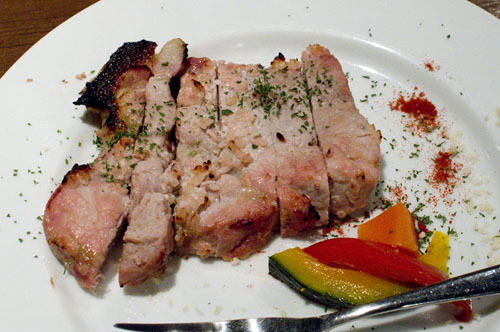 The grilled chicken marinated in moromi miso has a surprisingly soft, sweet flavor, and the grilled pork with shiokoji (fermented malted rice and salt), though not as fatty as might be expected, had a beautifully complex taste and pleasingly firm texture. Other meaty dishes include Angus beef steaks, beef-tendon stews, grilled pork belly with smoked camembert, grilled homemade bacon and charcuterie platters. 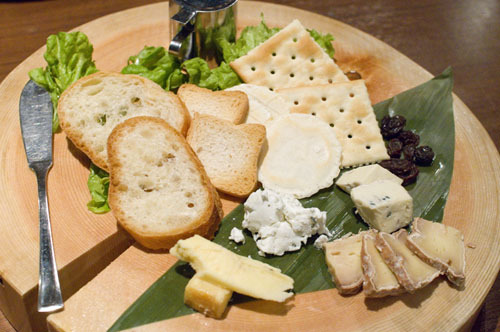 If you're still in the mood for cheese, Saika offers thirty different cheeses from around the world in custom-made platters. Unfortunately this was the one disappointment of the meal - cheese portions are on the skimpy side for the price, especially compared to the more generously portioned cheese platters that are becoming popular at Tokyo wine bars. Other than the cheese course though, prices here are very reasonable, with most main dishes priced at under Y1000. The wine list is also very affordable, with a selection of ten wines priced at Y3000 per bottle and Y700 per glass. There are higher-priced wines as well, but all within a very reasonable range. 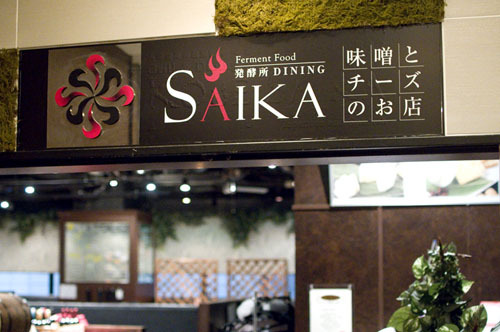 There's also a page of Japanese wines, plus wine-based umeshu, other fruit liqueurs, cocktails and several non-alcoholic mocktails. 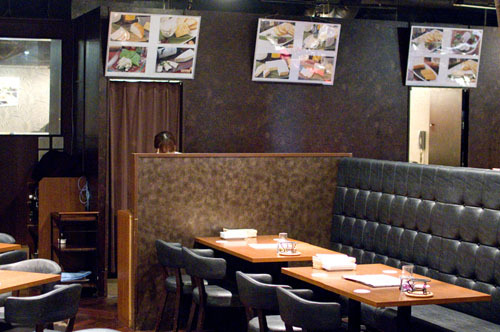 The dining room is spacious, with an extremely muted color scheme, and lively jazz plays on the sound system. Service is friendly and efficient, although a couple of dishes we ordered were unavailable. Budget around Y3500-4000 for dinner with drinks. Chuo-ku, Ginza 2-4-18, Arbol Ginza 6F.